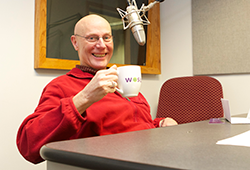 Mike Schmidt, WOSU Neil Legacy Society member, during his "LifeStories" recording at the WOSU studios. WOSU benefits from those who believe in passing on their values to future viewers and listeners and name WOSU Public Media a beneficiary of an estate gift. This special group of supporters is recognized as members of WOSU's Neil Legacy Society, named in honor of the Neil family who made 362 acres of farmland available for what is now The Ohio State University - the campus upon which WOSU was founded. The Neil Legacy Society honors those who have invested in WOSU's tradition of excellence long into the future. Legacy gifts are part of a deeply rooted tradition at WOSU. Those who establish a planned gift of any size play a key role in securing WOSU's future and are recognized by the Neil Legacy Society. These donors have remembered WOSU with a lifetime income gift or as a beneficiary of a will, trust, retirement plan, or life insurance policy. Members receive invitations to special events and updates on university giving news. By notifying the WOSU Office of Advancement of your gift commitment, you will be included among the donors recognized by the Neil Legacy Society. We are deeply grateful for these gifts and know they will enhance the programs and support the people who are part of public media. For more information about planned giving and The Neil Legacy Society please contact WOSU Office of Advancement at advancement@wosu.org or at 614.292.9678.